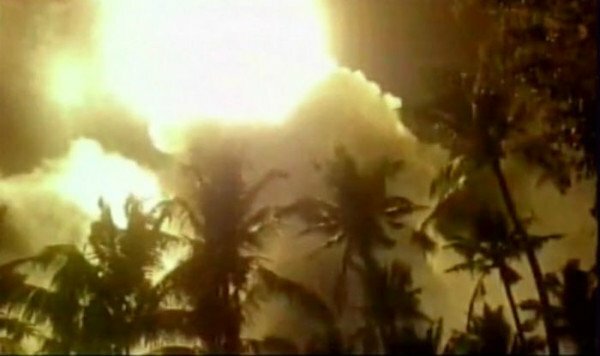 At least 100 people have been killed after fireworks sparked an explosion and blaze at a Hindu temple in the Indian state of Kerala, police say. The fireworks, which were to be used to celebrate a local new year festival, exploded about 03:30 AM local time, local media say. A building at the temple then collapsed, causing many of the deaths. More than 200 people were injured. Indian fficials said permits for the display had been refused after safety fears. PM Narendra Modi is traveling to the scene, in the coastal town of Paravur. He tweeted that the incident was “heart-rending and shocking beyond words”. As morning broke, hundreds of people arrived at the temple in search of relatives and friends while emergency teams used bulldozers to clear the area looking for survivors. A team of specialist doctors was being sent from Delhi amid reports of horrific burns suffered by those injured. Many are said to be in a critical condition in several hospitals. Many of the dead were charred beyond recognition and would have to be identified by DNA tests, Kerala police chief TP Senkumar said. Thousands were at the temple complex for the festivities when the explosion happened. TV footages showed big clouds of smoke as fireworks went off in the night sky. The fireworks had been stored ready for celebrations of Vishu, a Keralan festival marking the Hindu new year. The local district magistrate had denied permission for the display to be held this year because of safety concerns and complaints from residents. The Kerala government has ordered an investigation, and the police are planning to take action against the temple administration and the contractors who were putting on the display. “There was no permission to even store the fireworks,” Kerala’s Chief Minister Oommen Chandy said. Kerala is in the midst of an election for a new state assembly but political parties have called off campaigning as a mark of respect for the victims.